Newcomer Family Obituaries - Shirley F. Fine 1938 - 2019 - Newcomer Cremations, Funerals & Receptions. 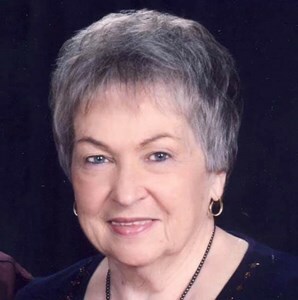 Shirley F. Fine, age 80 of Beavercreek, OH passed away peacefully on Tuesday, January 22, 2019. She was born February 27, 1938 in Middletown, Ohio to James and Sylvia (Egelston) Profitt. She married Ron Fine on July 3, 1986 in Beavercreek, OH and he survives. Shirley loved to knit, crochet, and various other crafts and was an excellent seamstress. She loved to collect family pictures that she made into collages for memorable birthday card magnets for the family. Shirley was a very active member of First Baptist Church of Kettering, where she loved serving in the church nursery, caring for her babies. She also worked at church after retirement as the church secretary and loved her church family. Shirley was very family oriented and was dedicated to her family and close friends. Shirley is survived by her husband Ron; three daughters, Teri (Marty) Copas, Marty (Erik) Larson; Jana Vaughn; two sons, Michael (Christine) Fine and Ronny Fine; 17 grandchildren; 17 great grandchildren; 6 sisters and 2 brothers from Arkansas; and other numerous family and friends. She is preceded in death by her parents; a son, Donnie Holzfaster; a daughter, Sandy Holzfaster; and a grandson, Jason Baldwin. A visitation will be held on Sunday, January 27, 2019 from 5:00 to 7:00 pm at Newcomer Cremations, Funerals & Receptions - Beavercreek Chapel, 3380 Dayton-Xenia Rd., Beavercreek, Ohio 45432. Funeral Services will be held on Monday, January 28, 2019 at 11:00 am at the funeral home. Burial will follow the services at Dayton Memorial Park, Dayton, OH. To share a memory of Shirley or leave a special message for her family, please click the Share Memories button above. Add your memories to the guest book of Shirley Fine. In the early 1990s we began developing the Kettering Christmas Pageant at the First Baptist Church of Kettering. We were endeavoring to dramatize the entire life of Christ from his birth through his crucifixion and resurrection. We needed dozens and dozens of biblical costumes in order to portray this amazing story. Shirley Fine volunteered to make some costumes. She made a few, and then she made some more. Every one was made with tender, loving care. Before it was over, Shirley Fine sewed an unbelievable number costumes in order to bring our production to life. Every time I watch a video of one of our pageants, I will remember the generous, kind, and thoughtful person who helped to make them possible by using her talents and her skills in such an unselfish way. Shirley was such a loving selfless person. She was such a joy to be around and talk to! She was so into her family and that in itself is priceless! She will be forever missed, but not forgotten!! Love and Miss you Aunt Shirley! My condolences to you Ron and your family on the passing of your wife. Person. Loved her crafts and always excited to do them in CC. Prayers for Family. You are in my prayers during this difficult time in the loss of your beloved Mother. Words are never adequate in moments like these. My heart goes out to you, and I hope that the love of family and friends will comfort and strengthen you in the days ahead. "The Lord is close to the brokenhearted and saves those who are crushed in spirit"
I'm so glad that Shirley met and married my cousin Ron. To find happiness again is the work of God and they were a loving and giving couple. They were my angels, looking after my mother, their aunt since my sister and I lived so far away. Shirley was so special in so many ways and there will be so many hands reaching out to her with love in her final destination. I'm sorry that I will not be able to attend the service as Paul and I leave Saturday for a week in Arizona. So sorry to hear about Shirley. Always enjoyed chatting with her during our "Kaffeeklatsch" at Panera. Shirley will be missed. Wishing you and the family peace to bring comfort, courage to face the days ahead and loving memories to forever hold in your hearts. We are thinking of each of you in the loss of Shirley. May the Lord bless you with His peace & comfort during the time of sorrow. Shirley will be missed by so many people at FBC-Kettering, where we have known her as a faithful servant & friend. Praise God for our blessed Hope that we have in Jesus! We know that Shirley is singing praises to the King of Kings! May you find comfort in knowing that you will see her, again. Ron & Family: I was so shocked to learn of Shirley’s homegoing. She was one Fine woman who served our Lord & church very devotedly & was a friend to anyone who ever met her. She will be leaving a large hole in a lot of hearts. My prayers are with all of you. Unfortunately, I won’t be able to join you, as I’m in FL; but I am sending love, hugs, & prayers. Shirley was one of the sweetest people I have known. She and Ron, who is my cousin, were very important to my family. They watched over my mother because both my sister and I live out of state. Always big card players, they spent many a holiday and Saturday night together. She will be missed by all who knew her. Shirley was one of the first to befriend me when I started attending FBK. She and I had lunch together many times and became close. She made my granddaughter a beautiful quilt when she was born. My granddaughter will soon be 24 and still cherishes that quilt. It was her favorite. She also made her a flower girl dress when she was in my niece's wedding. When my son got married, she was right there making the vest for him and for his best man and groomsmen. She was a dear friend and I loved her so much. She always had a smile and her heart was to help any and all who had a need. If I know anything, I know she is in heaven with her Lord and her family who were waiting for her arrival. I know you all will miss her so much and my prayers are with you during the difficult time. I moved away from the area 5 years ago and cannot attend the services but know I will be praying for each of you.